When Drake rapped "Turn the O2 into the O3, dog" London felt that. The English capital city's largest indoor venue has hosted many Drake shows over the years, leading to the brag in "God's Plan." Monday, April 1, is the start of a two-week residency in which Drake will play the 20,000 capacity arena seven times as part of his Assassination Vacation tour of Europe. To commemorate this run of shows, the O2 has temporarily changed its name (or at least it's sign) to the O3. 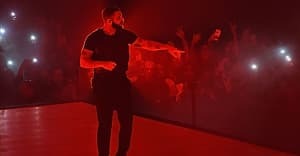 Drake himself noted the change, remarking "Turn it" on Instagram, while others who have encountered the sign in the wild have been posting their reactions on social media too. Thumbnail image courtesy of Vaughn Ridley/Getty.